HP Aruba MSR3012 High Performance Router. The HPE MSR3000 Router Series delivers high-performance medium to large branch routing up to 5 Mpps in a cost-optimized form factor. Featuring integrated routing, switching, security, and SIP with no additional licensing, you can boost your service delivery while simplifying management of your corporate WAN. 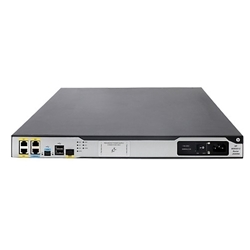 With the Open Application Platform module, the MSR3000 Router Series offers a wide range of virtualized applications. Its distributed architecture and high reliability also strengthen the resiliency of medium to large branches.